We at Wagner Meters know that crafting superior wooden musical instruments that sound as beautiful as they look is not just a “job” making instruments – but rather a true labor of love. 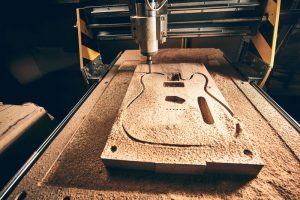 We understand how much time, effort, and loving craftsmanship go into ensuring every instrument you create is beautiful, sounds great, and will be playable for a lifetime. Now the way we see it when it comes to making fine, exquisite musical instruments from wood, you are only as good as your knowledge, your materials, and your tools. And one of the most essential tools is an accurate moisture meter. After all, you’re working with a living, breathing piece of wood. You’ve got to monitor its moisture content (MC) and its humidity throughout the manufacturing process or else your instrument will be ruined from warps, cracks, and other problems. That’s why many luthiers and major wood instrument manufacturers have come to depend on Wagner Meters. For many years, wood instrument makers have depended on our popular MMC220 moisture meter. 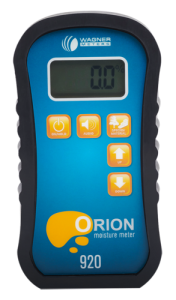 But now we’re pleased to announce the introduction of a more advanced and entirely new line of moisture meters – Orion®. Non-damaging. No one wants to put holes in a beautiful and expensive instrument when measuring for moisture with a pin-type meter. We don’t either. So all Orion meters are pinless and non-damaging. On-site calibration. All moisture meters must be calibrated to factory standards to provide accurate readings. But dropping a meter, day-to-day usage, and other factors can throw a meter out of calibration. When that happens, your only option is to send it to the manufacturer for recalibration – costing you time and money. Now while some meters can “verify” when they need calibration, they must still be shipped to the manufacturer for recalibration. You avoid that hassle altogether with Orion! That’s because only Orion meters give you the means to calibrate your meter to factory standards for the life of the meter. 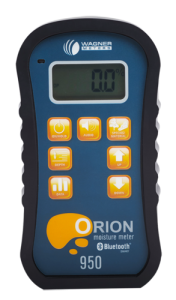 With our On-Demand Calibrator, calibrating an Orion meter is easy and takes only one minute. So your meter always stays in your factory – where it belongs! Dual-depth readings. Whether you’re measuring moisture in thin stock or thicker pieces that you plan to re-saw later, Orion has got you covered. Our shallow depth feature (1/4-inch or 6.35mm deep) is ideal for thinner woods, veneers, and laminates, like guitar and violin bodies, while our deep depth feature (up to 1.5-inches or 38.1mm) is great for thicker stock such as solid body instruments or raw materials. Accuracy. 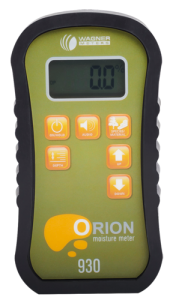 With its advanced IntelliSense™ technology, you can be assured of exceptional accuracy with your Orion meter. It’s another reason why more luthiers and instrument makers use Wagner meters than any other brand. Species settings. If you use a meter with a standard species settings default, your moisture readings from species to species could be several percentage points off. That could be disastrous! With our Fast Selection Species Settings, you easily and quickly set your Orion for the wood species you need to measure to ensure accurate readings. The range of settings covers practically any softwood or hardwood species in the world. Data collection. If you’re a large instrument manufacturer, you’ll find data collection particularly useful for collecting average/high/low moisture readings of your wood stock. Quickly gathering statistics on the wood you’re about to buy will tell you whether or not your supplier is providing you with quality, well-dried stock. Equilibrium moisture content (EMC). With its built-in humidity/temperature sensor, Orion meters will tell you the ambient conditions of where your wood stock is stored and then use that information to calculate the wood’s EMC. Knowing your wood’s EMC lets you know the exact moment it’s ready to be used. Industry-leading 7-year warranty. Because we’re so confident your Orion meter will give you years of great, reliable service, we’re offering you protection against any defects or issues for a full, industry-best 7 years. So you get not only a great meter, but the best protection in the industry for greater peace of mind! Each Orion model offers unique functions and features allowing you to pick the meter that best suits your needs. Orion 920, with shallow depth readings, is perfect for measuring thin wood materials like guitar or violin bodies, veneers, and the like. Orion 930 offers both shallow and deep depth readings – the shallow for thin woods and veneers, the deep for thicker boards from which thinner pieces are cut out of. 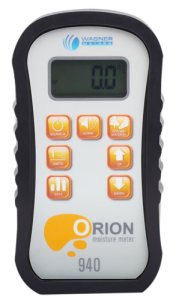 Orion 940 features dual-depth readings plus data collection capability. Data collection is ideal if you deal with large amounts of wood stock and want to analyze/record the high/low/average MC of your wood. Orion 950, our most advanced model, comes with all the features and functions of the meters listed above. It also comes with a sensor to capture and record ambient conditions, such as temperature, humidity, and other conditions and can calculate your wood’s EMC. Plus, it makes it a lot easier to store and send data you’ve collected to a computer or smartphone with its Bluetooth® app feature.